Tunein.com is one of the most popular radio directories around. Available online, via App, Smart TV's, Amazon Echo and Google Home. We are receiving a high volume of queries relating to the length of time Tunein.com take to respond to support questions. Radio.co is in no way affiliated with Tunein.com therefore we are unable to assist with improving their response time in any way. If you have not received a response from Tunein.com after 72 hours, we can only suggest contacting them again via their website. You can submit your station to using the link below. Please ensure your station is licensed correctly before doing this. Failure to have adequate royalty coverage may cause your station to become delisted. You will need to provide a listen link to add your station to Tunein.com. You can find them in your Dashboard under the listen tab. Tunein.com does not support HTTPS links. When pasting your links, remove the 's' from the URL to prevent an error. Radio.co includes support for the Tunein.com AIR API. 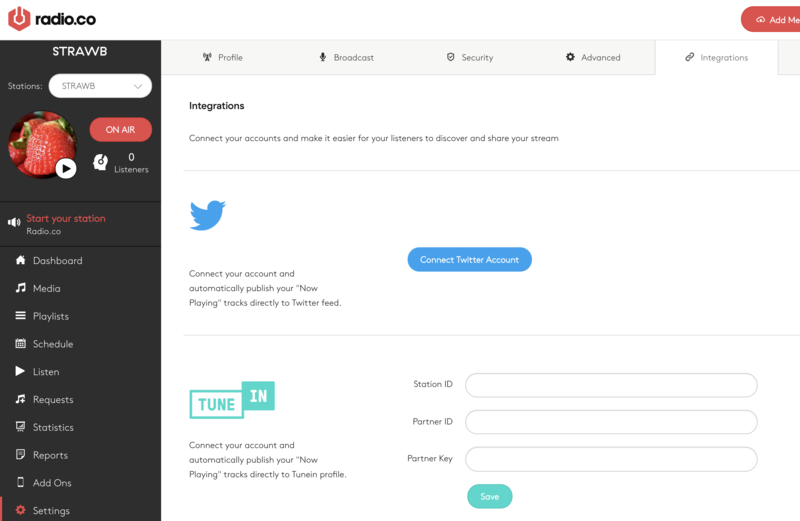 If you have your API details already, you can enter these on Radio.co Dash > Settings > Integrations. Please e-mail by clicking this link and provide your TuneIn station ID for permission to use the API. They will grant you a partnerId and partnerKey. Your station ID would be 's211838'.